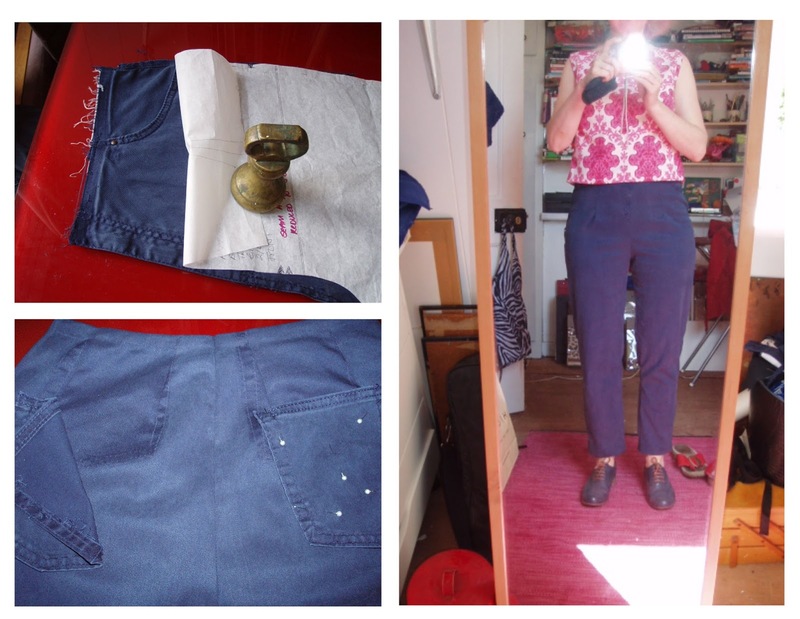 Its all sew pants – cigarette pants, trews, ankle grazers…………..
Trousers are something I find easier to buy off the rack, I find making trousers a pain and fitting issues too fiddly so buying off the rack and taking the waist in often seems easier (my waist is two sizes smaller than hip). Making tops, skirts, dresses and coats are what I prefer, and yet I wear jeans more than skirts on average due to practicality. 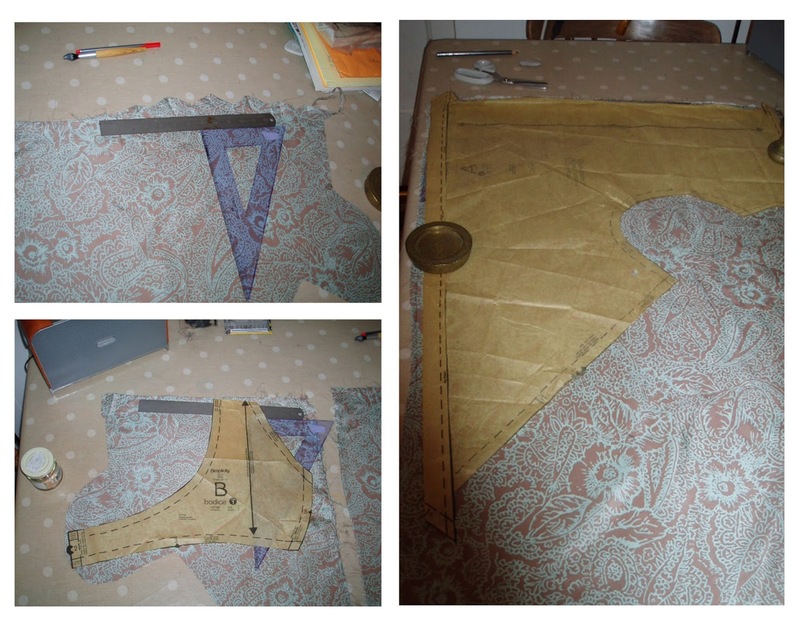 Part of my sewing mission has become to make a handmade wardrobe and now I needed to make some trousers! 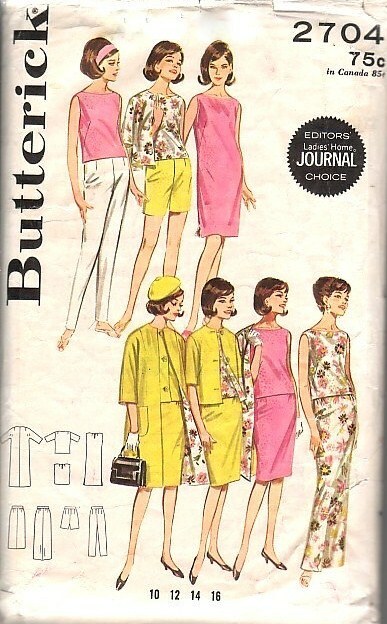 I started a pair last month, and based it on a butterick pattern I had done a toile for last year. I cut the trousers from a linen pair, but the weave was tighter, and the fit was awful. 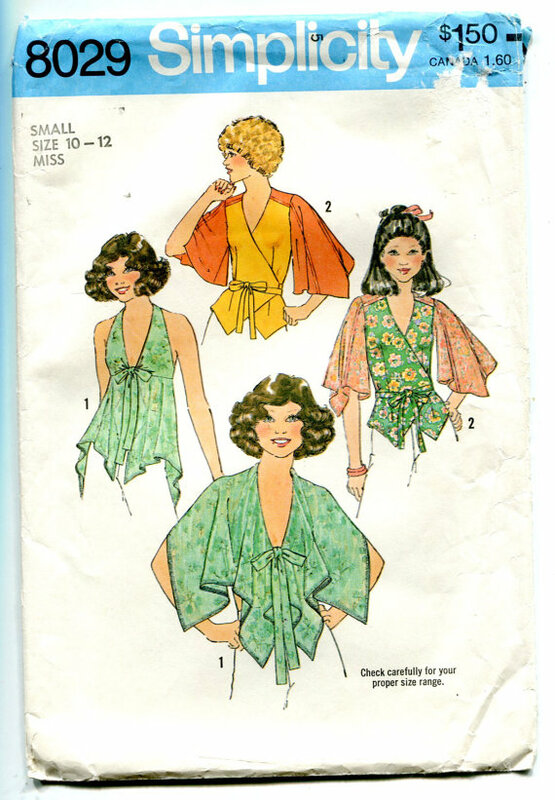 In part its a vanity issue, as I was in part relying on the ease allowed in a pattern rather than just using my brain and a full set of exact current measurements (seriously, there are times when I have worked from an old set of measurements thinking that these measurements still apply…..dream on……). So I figured I would take a break from them, and in the meantime, I found these jeans (stretch fabric and a size too big) in the charity shop and also in the colour I needed, so I figured I would do this one from scratch. I drafted a Jeans block with current exact measurements, and laid it over the Butterick 2704 to combine the two. 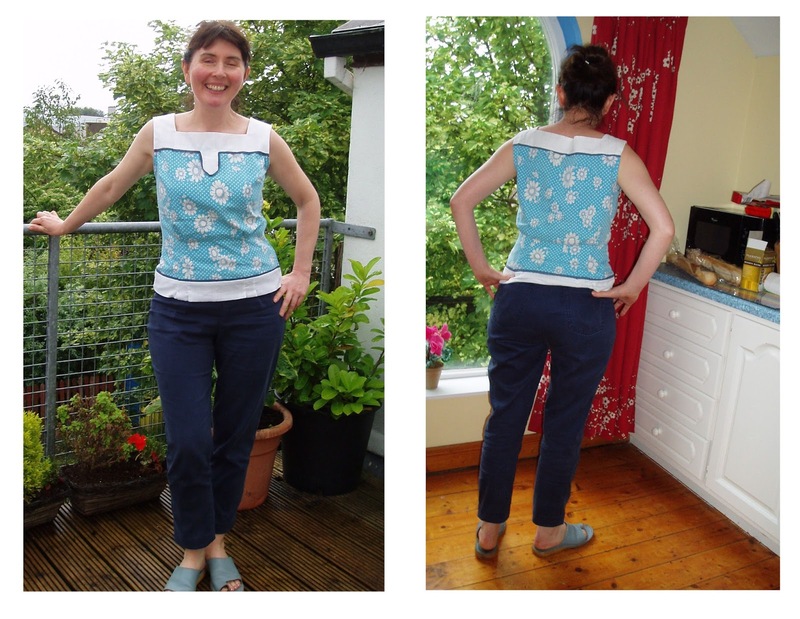 (I love the high waisted fit from waist to high hip fit in the Butterick) I used the jeans block for the leg however, when I laid it over the trousers fabric, it just about fitted and the leg line of the jeans were in a different direction (coincidentally the same as the Butterick). 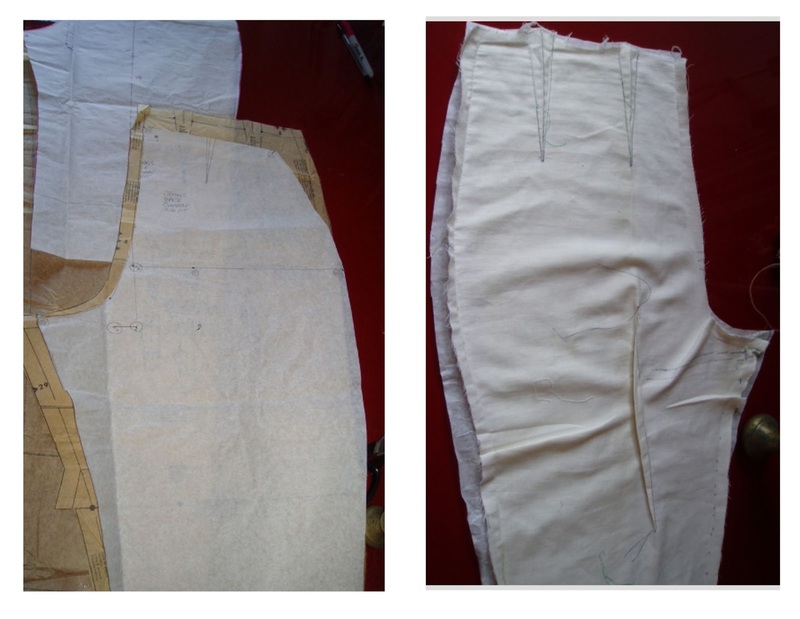 So I adapted the leg, and started on a muslin. The fit for the most was great, except now there was too much fabric under the back seat, and I was relying on partner J for critique, and a make-up mirror as a rear view on the full length mirror. I tried a ‘fish eye’ dart, but it didn’t improve anything, and even Allyne Bane (sewing guru go-to book) no insights, so I went with taking the excess fabric out in a dart going straight up the middle and it fixed it a lot so I undid the muslin leaving dart in place, and retraced the pattern, then I went ahead with pattern and cut. While this was going on, I have repaired my favourite jeans with sashiko mending (thanks to seeing it done by Karen, at RUDE) and its brilliant, I love the integrity of these repairs, its not trying to hide it, but makes the repair a thing in itself. I normally darn on the machine using a zig zag type stitch, but ultimately it doesn’t work that well with the stretch denim, I think it stresses the fabric more, so this time, I ironed black woven vilene (all I had) on the inside, stretching the jeans a little as I pressed, so the vilene had a wrinkle (deliberate) to accommodate the stretch. I then did some running stitch with button thread, but then started a type of cross stitch. What I did was a bit crude, but I love it. I really like the honesty of the hand stitch and its also a lot more sympathetic to the denim than the machine darn (I think) and its stronger as it moves with the fabric it a more sympathetic way. There are some gorgeous examples on pinterest, very inspiring! My sewing this last few weeks has been a bit chaotic We are getting some building work done (windows, and external wall fixes). We bought an old terraced house 2 years ago and are doing chunks of it over time, so huge heavy blanket lined curtains were taken down, some blinds made and still dust everywhere. I don’t like or loathe making blinds, but as I can sew, I feel obliged to make my own, and luckily found some curtain fabric in the charity shop that suited perfectly, and while I was there, I saw this pillowcase. I wanted to try out the simplicity pattern for a while, and have in mind to remake a yellow silk top, but cannot decide on sleeves or not, and thought I would try it first with the pillowcase. There was not enough fabric, but I figured I could add some white fabric for facings. Then, I thought some blue trim could make it less patched up, and put that in the mix, The lace trim was a bit fiddly, but the sewing straightforward. 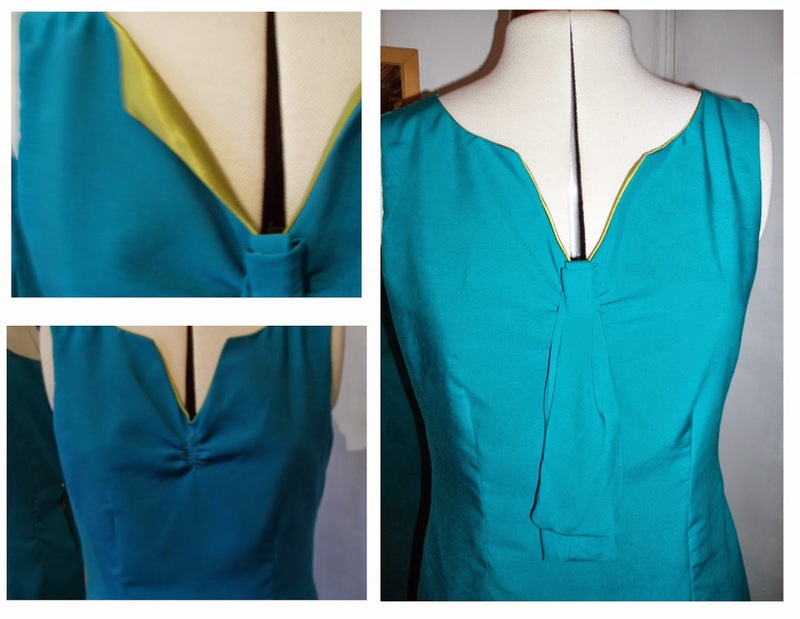 I cut as much of the bodice as I could from the pillowcase, and I put the trim and a strip of white fabric at the hem line, and I put a block of fabric at the neckline. 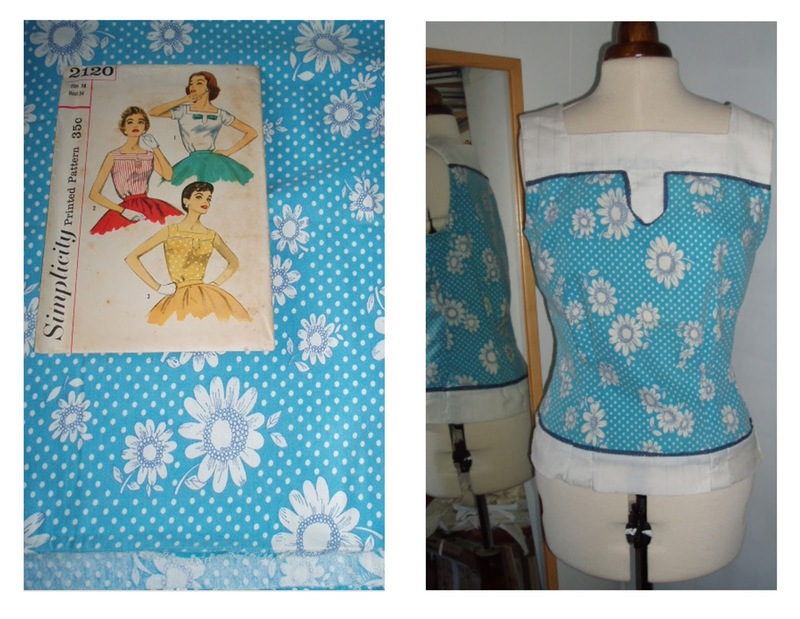 I relaid the pattern again, and shaped the armholes and neckline then marked in the darts and tucks and went from there. The summer has been slow to start here, so although I started this top 3 weeks ago, I only put a zip in yesterday! Temperatures are on the rise and it feels like the weather is not fully committing to summer yet, so I have not got a chance to wear it outside yet…..and I am looking forward to wearing it. The only thing I think could be changed, is to raise the waistline a half inch. I am high-waisted and think it sits a bit low, but then on the other hand, maybe it looks more casual like this? wearing it for a day will be the only way to find out.. 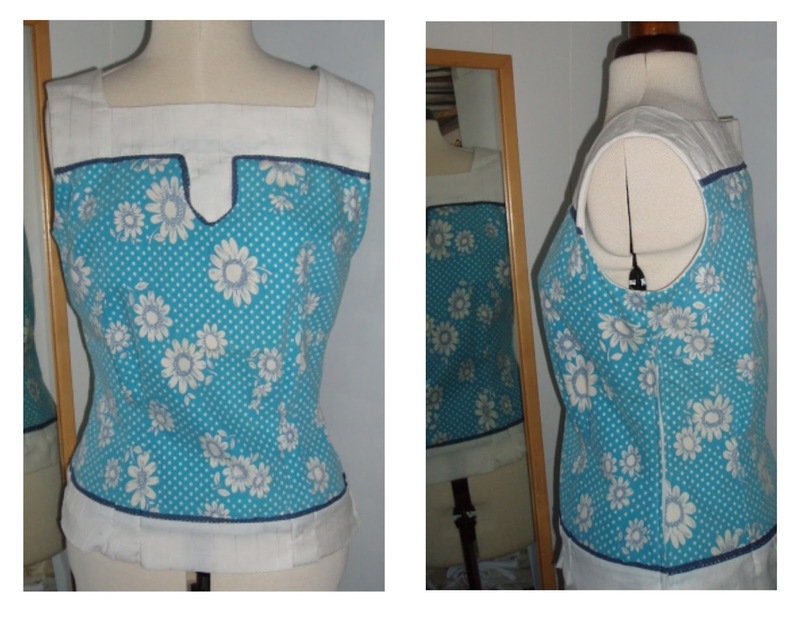 The tucks also give it a nice casual look….and equally the tucks will be easy to move up a quarter inch, and the pattern has the back yoke higher than the front, so in profile it looks uneven, and when I make this again, I will put these at the same level. 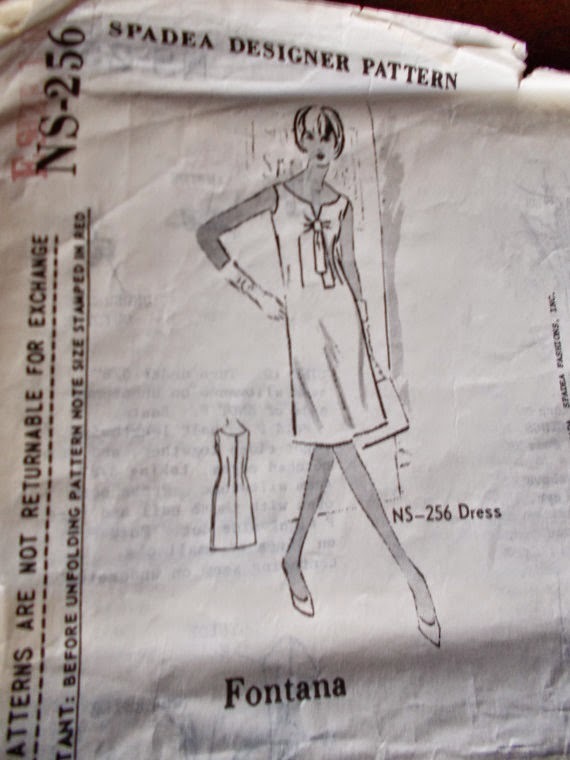 Other than that, I am planning the next bits of sewing, and they are broadly:- needs, wants, and musts.. The ‘need’ is to make some pyjamas, the ones I have are coming beyond redemption and my pjs tend to be old tees and leggings and they are even bit worn out by the time they become jim-jams, so I am thinking of making some nice (and some swanky) ones in the next while, this in part came about due to my fixation on 1930s beach pyjamas that featured on the we sew retro facebook post in February. 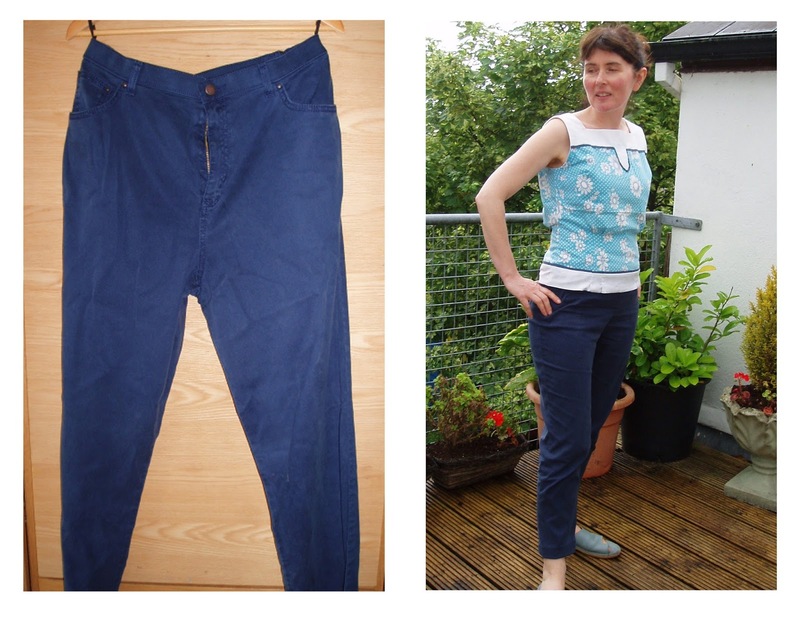 The ‘want’ is a pair of blue trousers (ankle grazers) for the summer as ultimately I find I wear jeans or trousers more than skirts, and I have one pair of very faded black ones, so hoping to make a blue pair (a match for the pillow top). I am assuming we will get some fine weather, as I am also planning a shibori summer dress! Finally the temperatures have increased. I made this top some time ago for my friend Fiona, and have only gotten around to posting it to her this week, and posting it here now! I got this silk skirt some time back, I loved the subtlety of the colours, bu they are not colours that I wear, but would suit my friend Fi, and I also wanted to try Simplicity pattern. Fi can wear those 70s styles so well, and I am unsure if she will wear this but I thought I would do it anyway! 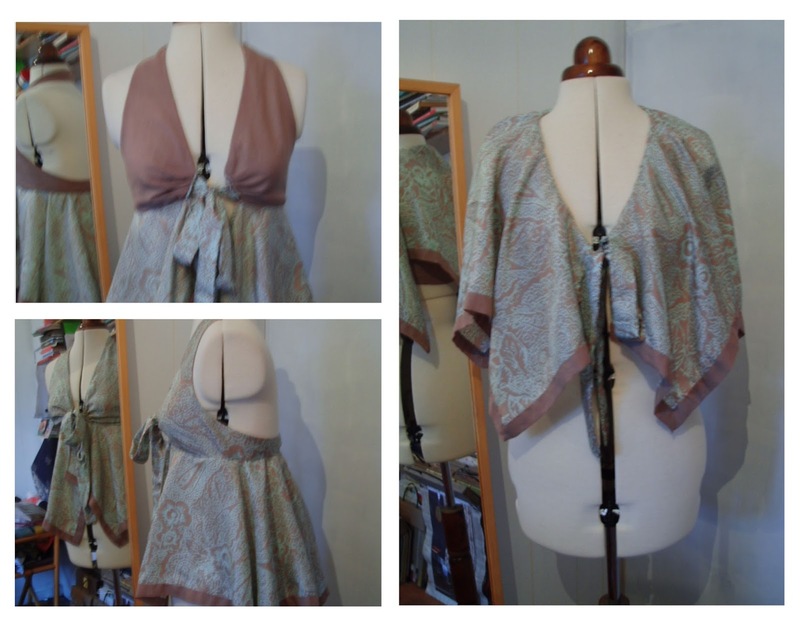 It is a simple front tie halter. and convertible to some kind of cape, which I think can only be useful if you want to shield your shoulders from burning….. It looks a lot more functional in the illustration! 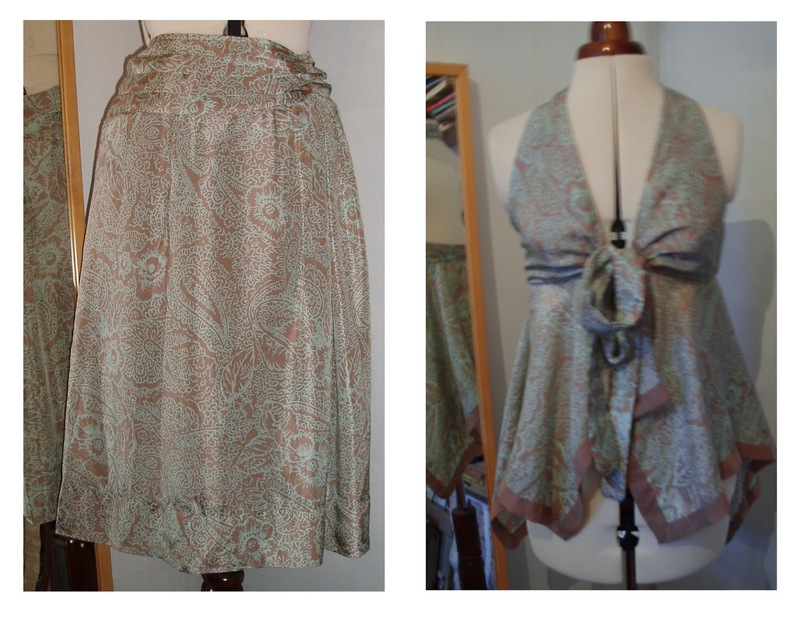 I used up all of the fabric from the skirt, and used the lining to bind the handkerchief edges and line the ‘bra’ part. I did a fair amount of hand sewing in the finish as it was a very very very thin silk. I was a bit aprehensive picking up this skirt at the Charity Shop. The colour was lovely, the seams were minimal, and the label New Look. New Look is like Pennys/Primark / Forever 21 – very fast fashion, very basic quality fabric. However, I also wanted to try out this Fontana Dress so I picked this on up. The fabric is viscose, so lovely drape, but so easily creased. The Spadea pattern is incredibly simple which is just as well as I believe their instruction can be minimal regardless of the complexity of the pattern. Its really a back, front, facings, tie and loop. So as I said… I basted the lining, just to be sure. Then it was just a matter of darts which were straight forward, and the facings. 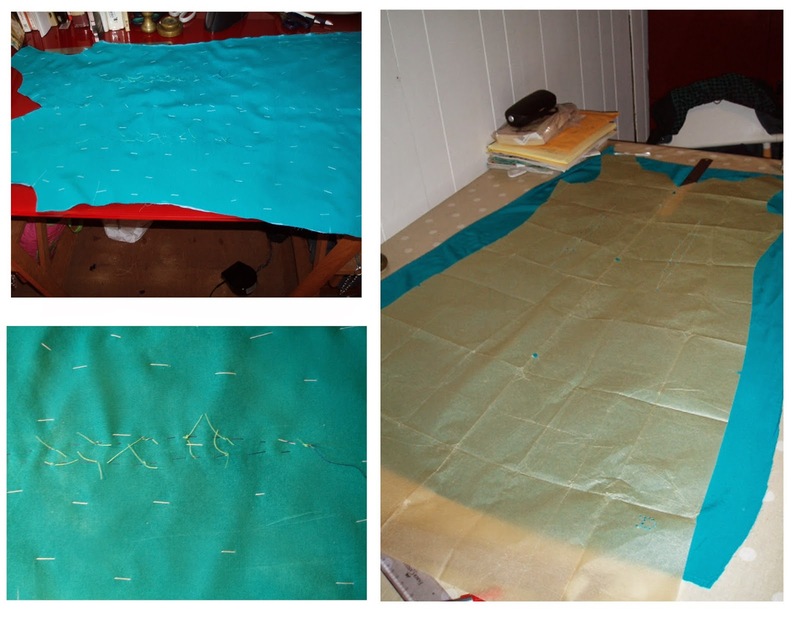 There was not enough fabric for the facings so I got a small amount of polyester in a contrast colour and used that. The tie was made of a mish-mash of scraps running in different directions. I was not going to get pedantic there – originally I was going to use the contrast colour, but it looks a bit like over kill so I didn’t. The dress is cut 10cm shorter than pattern as thats all the fabric I had, and this has the hem at knee length which I prefer. 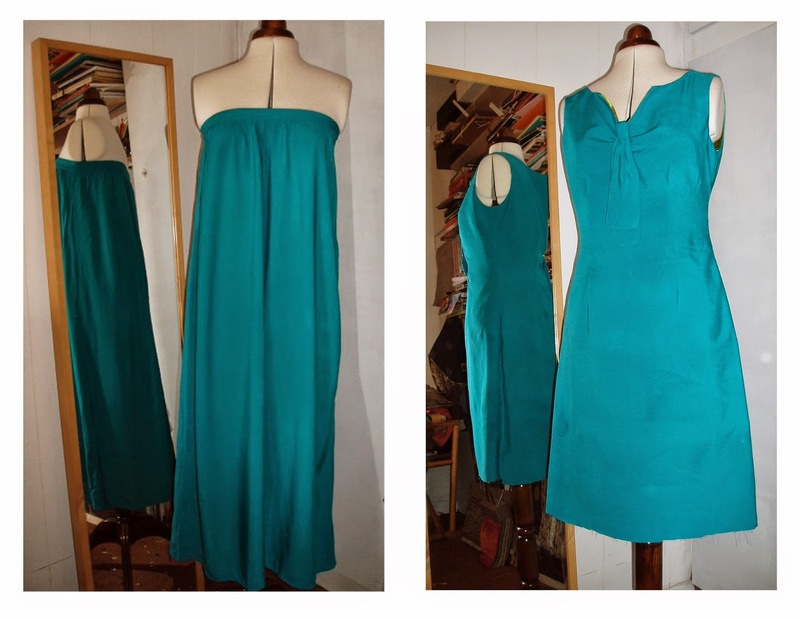 I have yet to put a zip in the dress and hem. I don’t have any occasion to wear it in the near future so I have left as is but it is hanging in my wardrobe as opposed to work room cupboard, so it is just waiting for a suitable moment! as a by-the-way, there is a good amount of ‘livability’ in the dress, I made the pattern up without alteration, and it easily fits my (non-conforming) hip measurement (up to 2 sizes bigger).when I sit down……………………….. very happy with dress, simple and effective.